Indian Hill’s Adam Schumacher lags close on the final green to clinch his first Illinois PGA title. 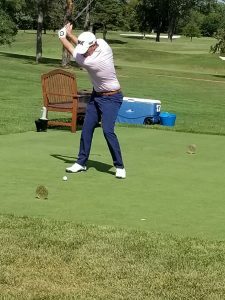 The Illinois PGA Championship has brought together the area’s top club professionals for 95 years, and Wednesday’s wrapup to the latest 54-hole test was one of the strangest. Only one player seemed to want to win it. 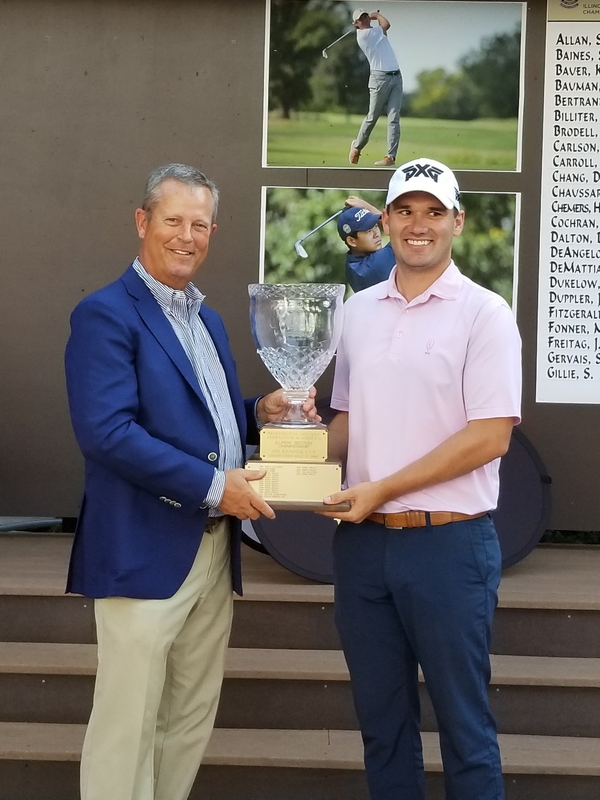 Adam Schumacher, in his fourth season as an assistant pro at Indian Hill Club in Winnetka, went on a hot streak on the back nine of Medinah Country Club’s No. 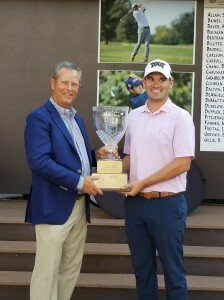 1 course and that propelled him to a three-stroke victory over playing partner Brett Walker, of Conway Farms in Lake Forest. Schumacher started the final round six strokes behind leader Jim Billiter, the head pro at Kemper Lakes. Billiter and one of his playing partners, Dakun Chang, battled with Schumacher for the lead until Schumacher took charge. Illinois PGA president Mark Labiak hands over the Jim Kemper Cup to Adam Schumacher. After a water ball at No. 10 led to a bogey he went on a birdie-birdie-par-birdie burst and no one challenged him again. The birdies at Nos. 11 and 12, from 10 feet and five feet respectively, made the water ball a bad memory and the final one, off a 15-foot putt at No. 14, sealed the deal. “Everyone was struggling, I kept grinding and it paid off,’’ said Schumacher, who earned $11,700 and also led the top 10 finishers into next year’s Professional Players National Championship. The hole which broke the tournament open was a hole that didn’t produce a birdie for Schumacher — the 295-yard 13th. Such short par-4s seldom impact a tournament like this one did on Wednesday. Schumacher and Chang were tied when Schumacher reached the tee for that hole. He hit his drive far right, into the adjoining No. 12 fairway, but was able to get on the green with his second shot and salvage par. Chang, an assistant at Twin Orchard in Long Grove, wasn’t as fortunate after putting his tee shot in the same area. He needed four approaches to find the putting surface and wound up with a horrendous seven. “I love that hole,’’ said Schumacher – and for obvious reasons. He made a birdie two on it in the first round on Monday. Schumacher shows the form of a champion on the back nine at Medinah No. 1. 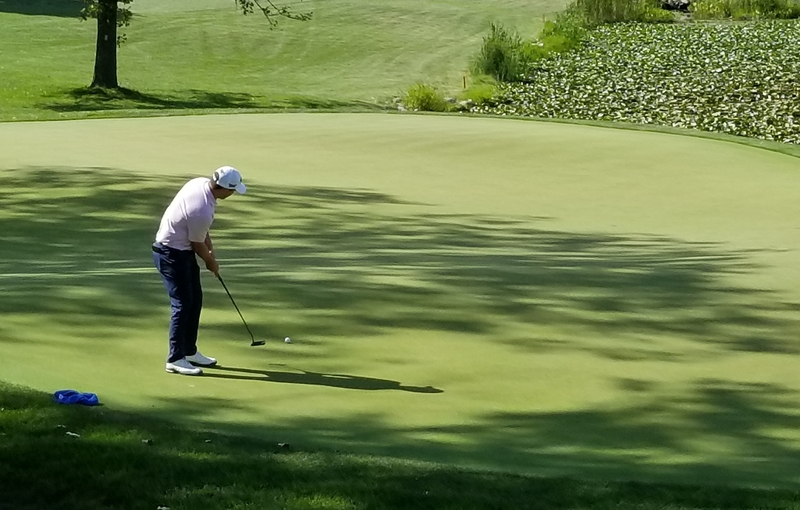 Doug Bauman, the 60-year old veteran from Biltmore in Barrington who played with Schumacher, made a rare birdie on the tricky 13th and that spurred him into a tie for third with Chang. Billiter made his first birdie at 13 after struggling mightily on the front nine. 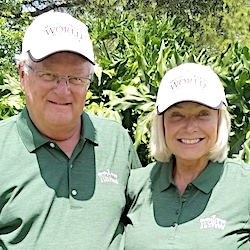 Billiter, despite shooting an 80, finished solo fifth and retained his lead in the IPGA Player of the Year standings with three of the year’s four majors now in the books. 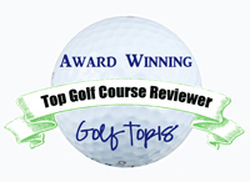 The final one is the IPGA Player Championship at Eagle Ridge, in Galena, in October. Billiter played in the last group with Chang and Walker, and they finished nearly two holes behind the Schumacher-Bauman group. “We were very slow,’’ admitted Billiter. “Brett played slow but was playing great, and we didn’t want to rush him.’’ Walker walked his round while Billiter and Chang, both known as fast players, rode carts. Schumacher posted a 69, one off the day’s best round by Glen View’s Chris Green, and posted a 4-under par 209 for the 54 holes. Walker shot 73 and was the only other player under par for the tournament. Twelve-time champion Mike Small, the University of Illinois coach, tied for sixth with Medinah teaching pro Rich Dukelow, who was one of five pros from the host club to survive the 36-hole cut. Among the others playing on Wednesday was Katie Pius, the only woman in the field. One of Bauman’s assistants at Biltmore, she tied for 35th.